A legend as old as times, 'Pokethropes' have gone by many names over the years. Skinwalkers, shapechangers and (most recently) genetics number among the more flattering of the names, with freak, mutant and monster numbering among the ruder. How a Pokethrope managed to gain their powers can vary from user to user, whether it be a bite from a feral one of their kind, and ancient curse, or a blessing from their god. No matter the source, nearly all Pokethrope's powers seem to be the same. A feral strength, an unnatural connection to Pokemon, and the ability to change their form almost entirely at will to gain the abilities of a Pokemon. While a Pokethrope's abilities in combat are a bit narrow, they more than make up for it with their ability to emulate the abilities of a Pokemon, allowing them to fly, burrow or even turn invisible. They even have an uncanny bond with Pokemon, making it easy for them to blend in with other Pokemon or even run their own pack. 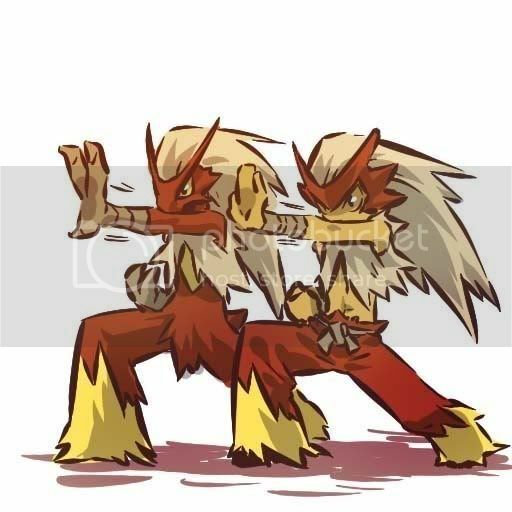 In most campaigns, a common theme for a Pokethrope would be learning how they obtained their powers, or finding a way to remove them. In others, maybe Pokethropes are common and the Trainer wishes to earn them equal rights. In any case, a Trainer's Pokethrope status is extremely easy to integrate with the campaign due to how closely the Class is linked with their very nature. Form Type: Select what Type your Pokethrope is. For a monotype Pokemon, this is easy. For a dual typed Pokemon, you still have to select only a single Type. Try to pick the Type more indicative of the Pokemon. This is usually the Primary Type (listed first in the Pokedex), but sometimes Pokemon, such as Flying Types, are far more closely associated with their Secondary Type. The GM should have input when selecting the Form Type. Form Stat: This should be your Form's highest stat. This will effect the Moves you can learn in your Form, as well as your stat tag, are linked to this. Form Skill: This should be your Form's highest Skill. Other than prerequisites, it's not really used for much. If there is a tie, refer to later forms of the Pokemon's evolution. If there is still no highest stat, select between the ones tied for highest as your Form Stat. Signature Move and Ability: This is more up to you and doesn't come into play until late in the class, choose the Move and Ability that you can the GM best feel link to this stat. In the case of Ninetails, this could be Fire Spin and Fox Fire, for example. If you select a Connection Ability, the Move associated with that Connection must be chosen as the Signature Move. As a note, a Form can technically be any step in the Pokemon's Evolutionary tree, although some Pokethrope Powers will be difficult to acquire without a final stage. This doesn't mean that you can't fluff your Pokethrope as evolving over time; a Machamp Pokethrope may first look like a Machop, then slowly grow into looking more and more like a Machamp. In addition, let your player more or less define what their Form looks like, although only allow it to look exactly like their Pokemon with the Wild Shape Pokethrope Power. GM Notes: While this Pokethrope is far less dependent on the actual Pokemon chosen than previous versions, it still can suffer from a Trainer selecting a too versatile Pokemon. Be careful with what Pokemon you allow your Trainer to select, and don't be afraid to veto a Pokemon if you need to. Also, if they want Darmanitan or Rotom, work with them; these Pokemon have Abilities that grant them more coverage than normal, so be careful with that. Effect: You gain three Form Points, as well as one additional for every two Pokethrope feats you possess, not including this Feature. You may use Form Points to purchase effects on the list Pokethrope Powers. A Pokethrope Power may only be purchased multiple times if it is explicitly stated. When this Feature is Bound, gain the purchased Capabilities. Note: Pokethrope Powers are purchased once and gained when you Bind the Feature, not purchased every time the Feature is Bound. In addition, you do not have to spend Form Points as you earn them; you can save them up to buy the more expensive Powers. Effect: Gain the Last Chance, Type Strategist or Type Aura Ability of your Form Type. Effect: Learn two Pokethrope Moves, from the table labeled Feral Power Moves. You may choose any Move marked with the Feral Power Rank you are taking or lower. Effect: Your Struggle Attacks deal damage of your Form Type while Pokethrope is Bound. Gain two Form Points. Effect: While Pokethrope is Bound, you gain the Weaknesses and Resistance of your Form Type, with Immunities being treated as a Double Resistance. Gain one Form Point. Effect: While Pokethrope is Bound, you gain your Signature Ability and may use your Signature Move. For all the Moves below, any or effect must be selected when you choose the Move, at which point it becomes permanent. At-Will 2 Form Type DB 5: 1d8+8 / 13 or Melee, 1 Target When you select this Move, select one of the Status Conditions from the chart below. On the appropriate roll, inflict that Status Condition. At-Will 2 Form Type DB 5: 1d8+8 / 13 or Melee, 1 Target On 16+, lower the target's Form Stat by 1 CS. If your Form Stat is HP, the target instead loses a Tick of HP. EoT - Form Type - Self, Coat The user gains three activations of Soul Cry. The user may either activate Soul Cry when using a Move of the same Type as Soul Cry to get a +5 bonus to damage or when hit by a Move of a Type that is Resisted by Soul Cry's Type to gain 5 Damage Reduction against that attack. EoT 2 Form Type DB 6: 2d6+8 / 15 or Ranged 6, 1 Target When you select this Move, select one of the Status Conditions from the chart below, doubling the Effect Range. On the appropriate roll, inflict that Status Condition. Scene x2 2 Form Type DB 8: 2d8+10 / 19 or Melee, 1 Target When you hit with this Attack, increase your Form Stat by 1 CS. If your Form Stat is HP, gain Hit Points equal to half of the damage they dealt to the target. EoT - Form Type - Self If the user performs a Form Type Move on their next turn that deals damage, add its Damage Dice Roll an extra time to the damage. Raise the user’s Form Stat 1 Combat Stage. If your Form Stat is HP, gain 1 Tick of Temporary HP. Scene x2 3 Form Type DB 12: 3d12+10 / 30 or Melee, all adjacent foes, Smite After damage is dealt, the user becomes Enraged and Confused. Scene x2 7 Form Type DB 11: 3d10+10 / 27 or 4, Ranged Blast 2, Smite When you select this Move, select one of the Status Conditions from the chart below. On the appropriate roll, inflict that Status Condition. If the target is in Aligned Weather, Feral Destruction cannot miss. Daily x2 2 Form Type DB 8: 2d8+10 / 19 or Ranged 6, 1 Target Gain an Effect depending on your Form Stat: HP: Gain two Ticks of Temporary HP after using this attack. Attack: Add the Vortex and Smite Keywords to this Move. The Target is Vulnerable as long as they are in this Vortex. Defense: Resist all Physical attacks one step further for one round. Special Attack: Add the Vortex and Smite Keywords to this Move. The Target is Vulnerable as long as they are in this Vortex. Special Defense: Resist all Special attacks one step further for one round. Speed: The Move gains Priority (Advanced). Daily x2 None Form Type - Field, Weather The weather becomes Aligned for 5 rounds. While Aligned, Form Type Attacks gain a +5 bonus to Damage Rolls, and a Type Super Effective against your Form Type Attacks suffer a -5 Damage penalty. Wild Intuition None 1 Gain the Skill Stunt (Intuition, Form Type) Edge. Beast Tongue None 3 You gain ability to communicate flawlessly with Pokemon while Pokethrope is Bound. Adapted Body None 1 Gain a +2 Bonus to your Form Skill while Pokethrope is Bound. Wild Shape None 1 Gain the Size of your Form while Pokethrope is Bound. Form of Burden Wild Shape, Form Size is at least Medium 1 Gain the Mountable 1 Capbility while Pokethrope is Bound. Strong Form Form has at least Power 8 1 Increase Power by +2 while Pokethrope is Bound. Leaping Form Sum of Form's Long and High Jump is at least 5 1 Increase both Long and High Jump by +1 while Pokethrope is Bound. Sprinting Form Form has at least Overland 8 2 Increase Overland Speed by +2 while Pokethrope is Bound. Diving Form Form has at least Swim 8 or Swim 6 and Gilled 2 Increase Swim Speed by +3 while Pokethrope is Bound. Digging Form Form has at least Burrowing 6 4 Gain a Burrow Speed of 6 while Pokethrope is Bound. Floating Form Form has Sky or Levitate Speed 2 Gain a Levitate Speed of 2 while Pokethrope is Bound. Gliding Form Form Form has Sky or Levitate Speed of at least 4. 3 Gain a Levitate Speed of 4 while Pokethrope is Bound. Soaring Form Form has Sky or Levitate Speed of at least 6. 4 Gain a Levitate Speed of 6 while Pokethrope is Bound. Natural Environment Form has a Naturewalk Capability. 2 Gain a Naturewalk Capability that your Form has while Pokethrope is Bound. This Pokethrope Power may be selected multiple times, selecting a different Naturewalk each time. Innate Capability Form has the Chilled or Heater Capability 1 Gain the Capability that you qualified for this Power with. This Power may be taken multiple times, selecting a different Capability each time. Treat yourself as a Level 20 Pokemon if it requires a Level. Basic Capability Form has the Alluring, Nightvision, Egg Warmer, Gilled, Inflatable, Pack Mon, Premonition, Shrinkable or Stealth Capability 2 Gain the Capability that you qualified for this Power with. This Power may be taken multiple times, selecting a different Capability each time. Treat yourself as a Level 20 Pokemon if it requires a Level. Advanced Capability Form has the Amorphous, Blindsense, Dead Silent, Dream Reader, Fortune, Groundshaper, Magnetic, Mindlock, Reach, Threaded, Tracker, Tremorsense, Wallclimber or X-Ray Vision 3 Gain the Capability that you qualified for this Power with. This Power may be taken multiple times, selecting a different Capability each time. Treat yourself as a Level 20 Pokemon if it requires a Level. High Capability Form has the Blender, Dream Mist, Gardener, Heart Gift, Herb Growth, Honey Gather, Illusionist, Invisibility, Juicer, Leaf Crafter, Milk Collection, Murshroom Harvest, Phasing, Shadow Meld, Sprouter, Telekinetic or Telepath Capability 4 Gain the Capability that you qualified for this Power with. This Power may be taken multiple times, selecting a different Capability each time. Treat yourself as a Level 20 Pokemon if it requires a Level. Master Capability Form has the Wired or Shapeshifter Capability 6 Gain the Capability that you qualified for this Power with. This Power may be taken multiple times, selecting a different Capability each time. Treat yourself as a Level 20 Pokemon if it requires a Level.